Welcome to The Hall of Blue Illumination, a podcast dedicated to the world of M.A.R. Barker’s Tékumel. In this episode, we discuss James’s work within the setting of Tékumel, and his correspondence with Professor Barker. James is the editor of The Excellent Travelling Volume, a digest-sized print-only fanzine dedicated to the original Empire of the Petal Throne ruleset. [00:01:20] James discusses his history with Tékumel and Empire of the Petal Throne. [00:04:18] Professor Barker’s participation in the community around Tékumel and James’s correspondence with him. [00:05:45] James’s favorite story about his correspondence with Professor Barker. [00:09:53] Victor’s experience with Professor Barker’s creative approach to questions about the world of Tékumel. [00:15:35] “Oh yes, I know the fellow!” James’s experience detailing the personalities of his own campaign to Professor Barker. [00:21:40] The attraction of the original EPT game and ruleset. [00:24:30] James discusses the motivation behind the creation of The Excellent Travelling Volume zine. [00:26:52] James’s role in creation of a proper character sheet for EPT. [00:30:00] A retrospective look at EPT‘s original referee charts. [00:31:03] 3×5 cards as character sheets! [00:33:13] Player numbers and the dynamics of Professor Barker’s campaigns. [00:35:01] An anecdote from Victor regarding an early roleplaying interaction with the Professor. [00:38:20] Organizing principals for parties in Professor Barker’s campaigns. 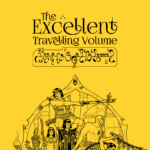 [00:42:01] The relationship between the content of The Excellent Travelling Volume and James’s own campaigns. Swords & Glory Vol. 1 is available as a PDF or in print from RPGNow. The Gardásiyal ruleset is out-of-print. It was originally published by Theatre of the Mind Enterprises between 1992 and 1994.